A reader has pointed out that support for my assertion that classical music has been covertly dumbed down comes from none other than Norman Lebrecht. In his review on Sinfini Music - hey guys, when will you link to On An Overgrown Path? - of percussionist Kuniko Kato's new album Norman concludes by saying "The sound, recorded at 24-bit/192hz... is outstanding... why can’t all records sound this good?" Cantus by Kuniko Kato is released on Linn; the label is a provocative champion of lossless audio files and an interview with their MD Gilad Tiefenbrun was linked from my post. The coincidence of a trail leading from Sinfini Music to Linn Records and back to Universal Music should not detract from the revelation in that interview that "Linn Records, has also teamed up with Universal to create a back catalogue of the music giant’s records in studio master quality". There has been an astonishingly large readership for my posts on potential links between ultrasound and audio quality. Despite the absence of comments and discussion recently noted by both Elaine Fine and Tim Rutherford-Johnson applying to these posts, their wide circulation on social media indicates general receptivity to my views on the shortcomings of low resolution audio. In keeping with a parallel trend, there have been a few comments from abusive and anonymous trolls of the - quote - "your assertions are complete twaddle" kind. I am no longer publishing and spending time refuting these, not because they disagree my views but because they have no place in civilised debate. Those who interpret my posts as no more than rants about the compromised quality of low resolution audio files are missing the point. My exploration of how ultrasound may affect audio quality develops the long-running theme On An Overgrown Path that classical music is an infinitely complex set of interactions that cannot be adequately expressed in today's binary lingua franca. There are many things about classical music that science alone cannot explain. One is why a Stradivarius violin has a unique sound that cannot be replicated by modern instruments lovingly constructed using state-of-the-art technology. Another is why digital audio fails to capture the magic that so many fine musicians dedicate their lives to creating. As another Norman so eloquently reminded us last year, we are by nature analogue beings. Classical music demands more from a listener than simply the possession of an iPod or MP3 player; it demands some preparation, some effort, a journey to a special place, saving up for a ticket, some homework on the programme perhaps, some clarification of the ears and sharpening of the instincts. And if those words sound familiar, it is because they are a contemporary paraphrase of Benjamin Britten's Aspen Award acceptance speech; the original text can be read here. Header image is reproduced from David Blackmer's article Life beyond 20 kHz, one of many valuable contributions to the ultrasound debate. Because no freebies were involved in the writing of this post I have not heard Cantus by Kuniko Kato; but, just this once, I will take Norman Lebrecht's views as accurate. Any copyrighted material on these pages is included as "fair use", for the purpose of study, review or critical analysis only, and will be removed at the request of copyright owner(s). Also on Facebook and Twitter. Thanks to Twitter my posts on ultrasound and audio quality have reached far beyond the established On An Overgrown Path audience. Which has brought into sharp focus a question that has been troubling me for some time, what is the purpose of the comments facility on my blog and also on my Facebook page? On An Overgrown Path is a personal website. Yes, it can be accessed by anyone, but every visitor is a guest in my personal space. I did not start the blog ten years ago to provide an open forum for all views. I started it to give a personal take on the arts and associated topics. Many of my posts disagree with widely held views and I am well aware - and so are most readers - that others hold views different to my own. It now needs to be clearly stated that the purpose of this blog – in which a lot of sweat equity has been invested – is not to provide an open forum for all views to be expressed. Readers who have followed the paths here over the years understand and respect that position, but a few newcomers do not. Alex Ross has one solution on his The Rest is Noise blog, he does not allow comments. That is a position I have seriously considered, but as On An Overgrown Path has a somewhat different character and depends more on mature reader participation I am loathe to adopt it. But moderating and responding to comments is fast becoming an unacceptable overhead, so my position on them has, of necessity, become hard line. I now expect comments to respect the views expressed in my personal web space, and, equally importantly, I also expect the views and activities of those I write about to be respected. Lengthy comments comprising personal views that contradict my own should not be submitted, simply because that is not what this web resource is for. Comments not meeting the above criteria are unlikely to be published. But, as before, comments highlighting the errors of fact I am too often guilty of are welcome, and so are brief pointers to facts and sources representing alternative viewpoints. There are those who will regard this stance as autocratic, which does not faze me. Nobody pays to read On An Overgrown Path, and nobody is forced to read it. Those who want a platform for lengthy expositions of their personal views should start their own website using the excellent freely available software solutions. What blogging desperately needs is more blogs expressing a wider range of views, not destructive comments all too often hiding beneath a cloak of anonymity. Stunned by Kuniko at Cheltenham two years ago - must buy this disc. I wonder, though, why you care if Sinfini Music links to you or not. After all, you don't like them and we know the kind of compromise they stand for. Just keep on ploughing your own individual path. And don't worry about Twitter - just ignore, as too few bloggers have. Presumably your space to blog won't ever be closed down, though who can see the future? Regarding your example of the Stradivarius, did you ever discuss the blind test from a year or so ago, where professional violinists couldn't tell the difference between a Strad and a new violin? I'm also reminded of wine tastings where blindfolded wine connoisseurs had difficulty distinguishing whites from reds, French from Californias, and so on. I'm certainly not saying your points don't have some level of validity, but I'm not convinced this is as big a deal as you seem to be. Jeff, thanks for that. Yes, I am aware of the blind testing of the Strad versus a new violin. There are similar double blind tests of extended frequency audio systems which produce contradictory results. My analogy of the sound of a Stradivarius was simply a way to illustrate that the quality of sound matters. As I explained in a comment on the first part my posts have two objectives. One is to open the minds of readers to the possibility that new research on ultrasound sheds light on the differences between live and recorded music. The other is to open minds to the possibility that new research on ultrasound sheds light on long-standing concerns about the impact of digital encoding - with its abrupt frequency cut off - on music. If the black art of sound quality is not a big deal why are millions spent on finessing the acoustics of new concert halls? Why don't we listen to classical music in utilitarian concrete sheds? I was with you until that last paragraph! A concrete room is a cacophonous reverb hellscape, and it's immediately noticeable. Acoustics aren't a particularly dark art—I've dealt with some of those issues in setting up my own home studio. I guess my bigger point is that, if we're looking for reasons why classical music doesn't have much traction with younger listeners, the loss of inaudible frequencies—whatever their effect—is almost certainly not the answer, or even in the top twenty. Some of the most powerful musical experiences of my life came from tinny transistor radios and almost comically limited car stereos. Jeff, we are going to amicably differ on this. Although frequencies above 20 kHz may be inaudible to the conventional hearing process, as pointed out in my two posts recent research has proved they can be sensed by the brain. 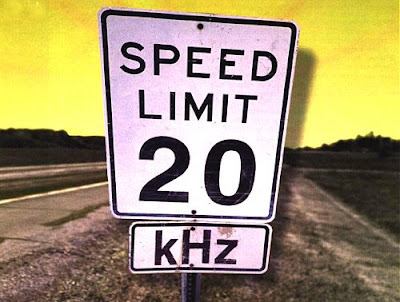 I too have been moved by music heard on limited frequency equipment, but all of them had a natural roll-off, not the 22.05 kHz chop associated with digital sampling. Some of my listening is still done using an analogue turntable which on paper should sound significantly inferior to the high end CD player it sits alongside. But it doesn't, and I will continue to explore possible reasons for what some of us have felt for some time, digital audio in its mass market formats does not do classical music justice.